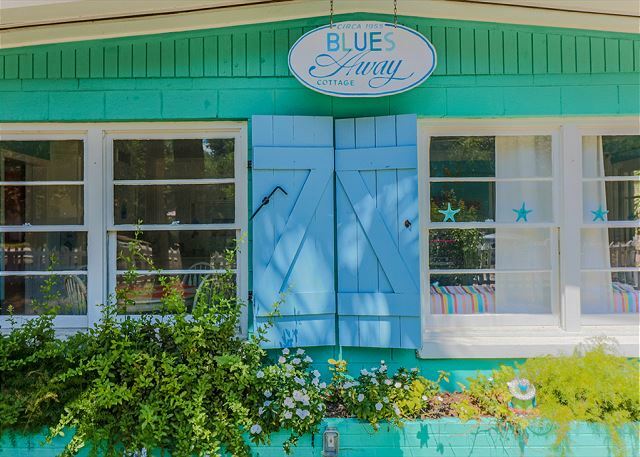 Welcome to Blues Away on Tybee Island! Circa 1958, you'll spend some time in history right here in the present! Blues Away will definitely take any blues away! 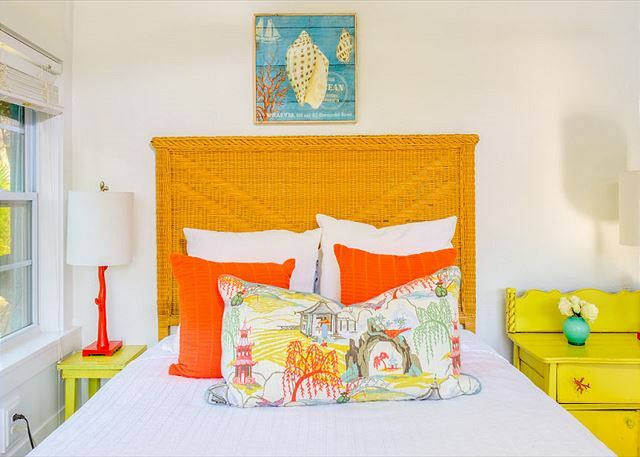 Fabulous colors and wonderful touches are just the beginning of your relaxing stay at Blues Away. 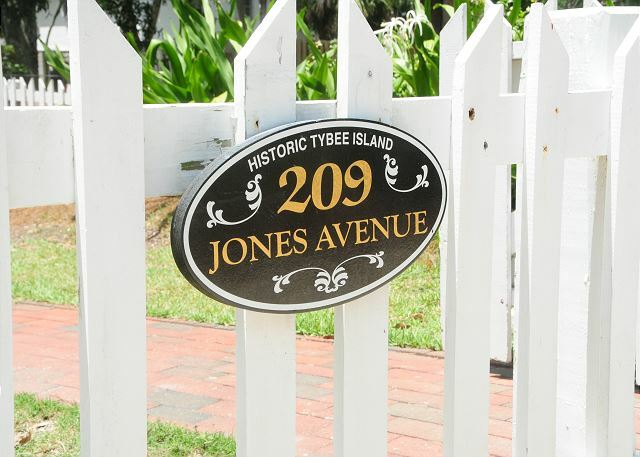 Historic Tybee Island. 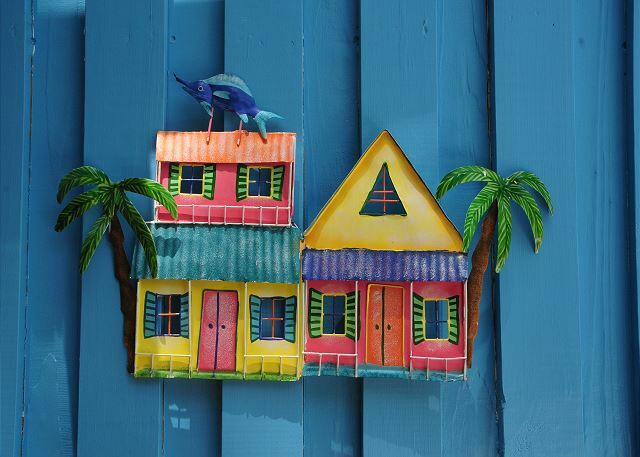 We love our Mermaid Cottages because most of them are a piece of history, and we revere that! Welcome to Blues Away Cottage! Circa 1955, this cottage is the ginchiest! See if you can make it past this amazing front porch! Sit here on this amazing screened-in porch! 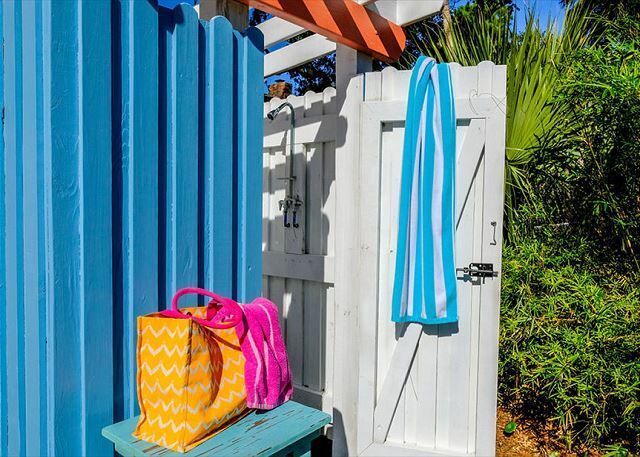 This vibrant door will make you smile before you're even inside. Walking in through the bright orange front door is just the start! Welcome to the living room. Screened-in porch looking back towards Jones Ave. 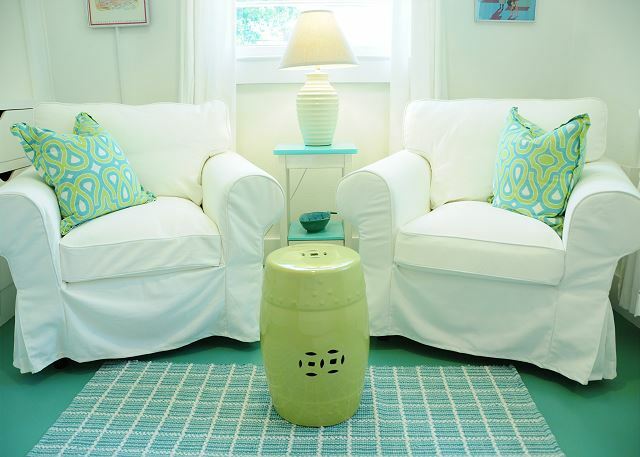 This bright and cheerful living room will make your heart soar. You'll want to curl up on this sofa and look out these windows, rain or shine. This great modern vintage kitchen will make cooking a treat! 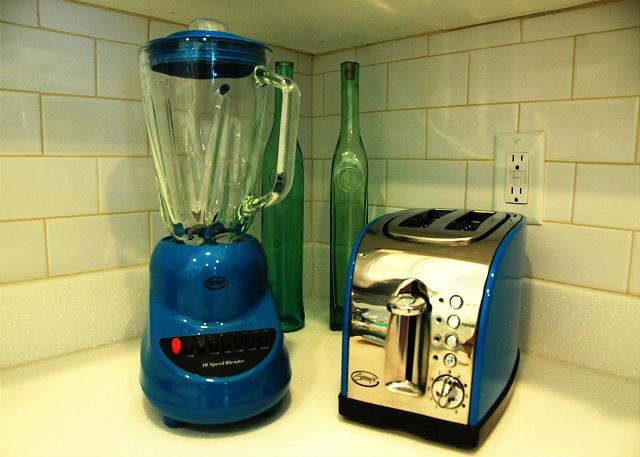 Love, LOVE these blue appliances! How retro modern! This wonderful palette of colors are so soothing and calm. 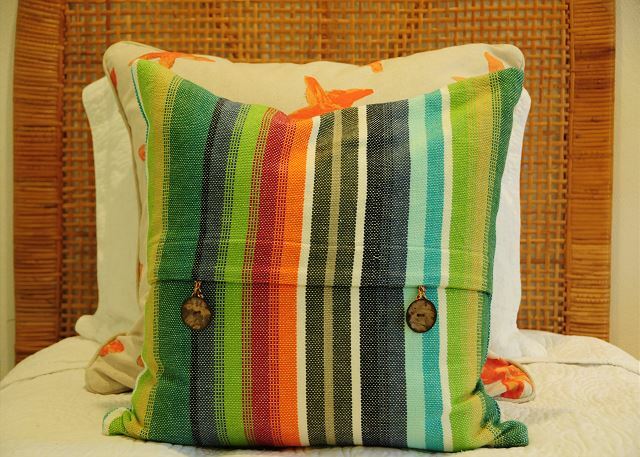 We love our throw pillows, and these are great! 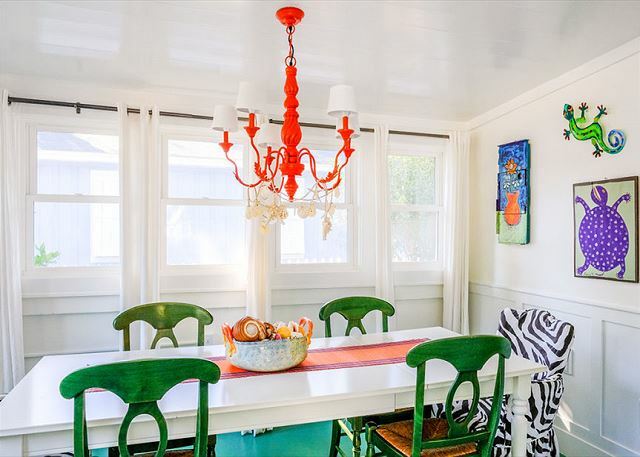 Tons of colorful details abound in this home away from home! Conversations, naps, reading time, just thinking about life. Right. Here. 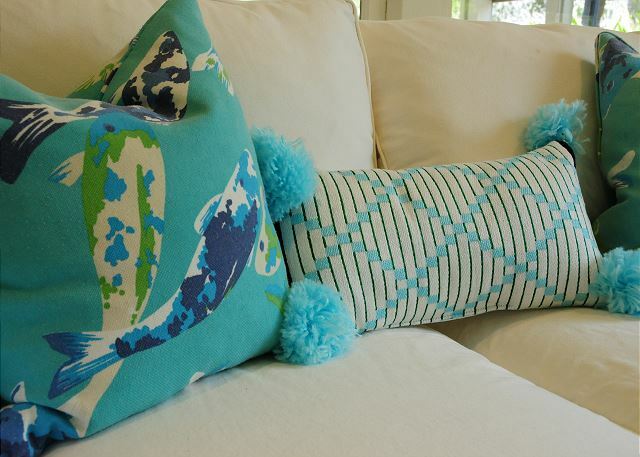 Soothing details will smooth your blues away. 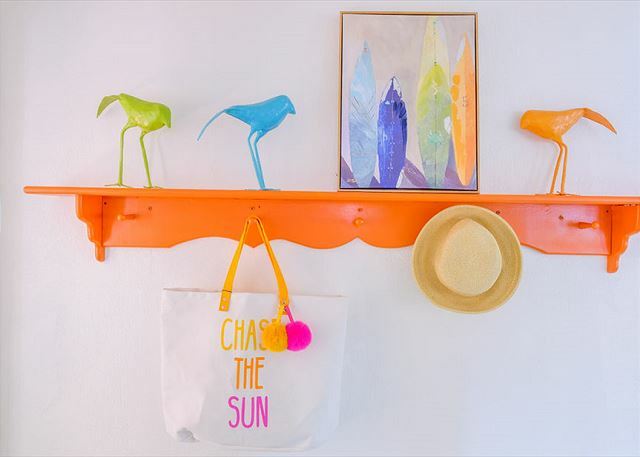 What a fun, bright shelf! The combination of colors in this home will make you want to bring a little Blues Away inspiration home! Come in and enjoy your time in the kitchen! Don't you wish you could be here now? Why thank you! You look great, too! Dinner, breakfast, lunch or just a place to sit and talk about the day. 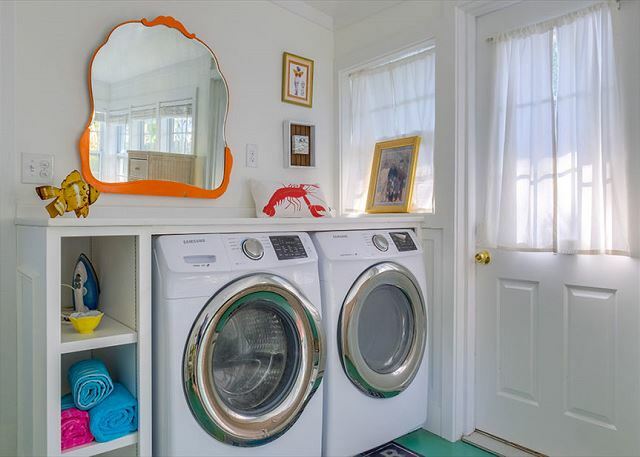 The washer/dryer are in the main bedroom. Even daily chores are a treat here! Sit. Get inspiration to take home with you! These windows are amazing. You'll wake up and want to lay here and dream. King bedroom is soft and mellow. 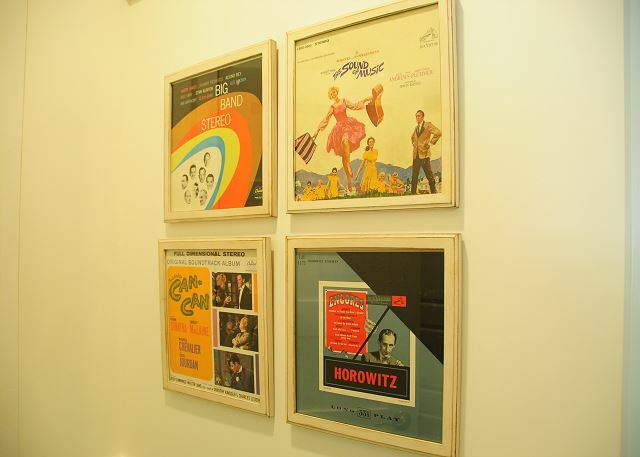 Wall-mounted TV for movie viewing. You'll wake up and want to stay in this room, but the rest of the house is calling as well! Decisions, decisions! 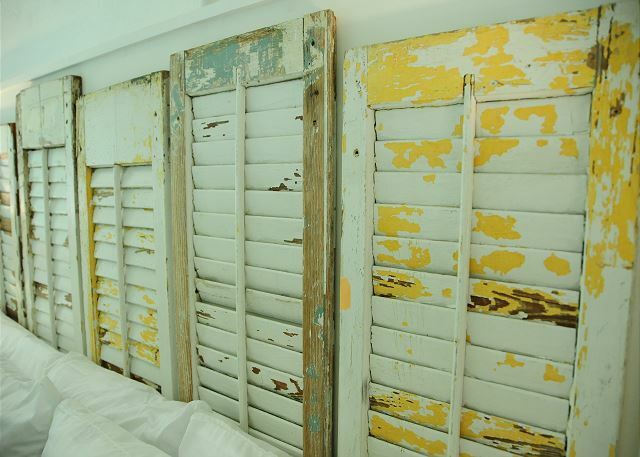 Amazing distressed shutters headboard are yet another piece of visual candy for you! Cozy up in these chairs and plan your day, read a book or watch Netflix (complimentary WiFi). Oh,wow. How much do you want to just dive into these chairs?? Twin bedroom with two colorful twins. Sun and Beach right here. Almost better than the real thing! Giggles and confidences will be shared in the double twin bedroom. Double twin bedroom is soothing and stimulating at the same time. Those colors! Yummy! More colorful details in Blues Away. Waking up in this room will be just the beginning of your amazing day! Bright, amazing, colorful details everywhere you look. What a cutie! These are the details we love in this cottage! 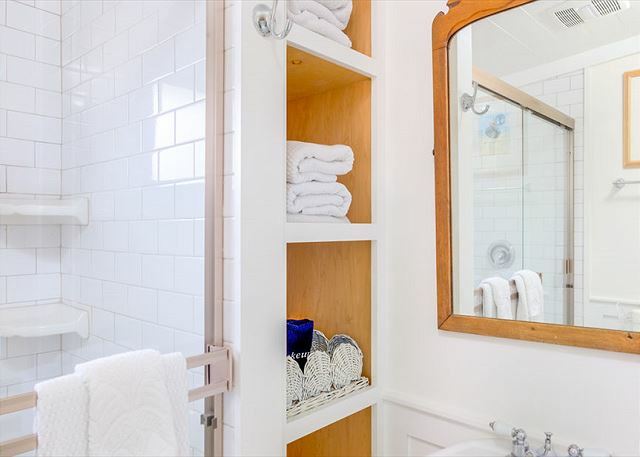 The white bathroom with bright pops of details will make you smile. 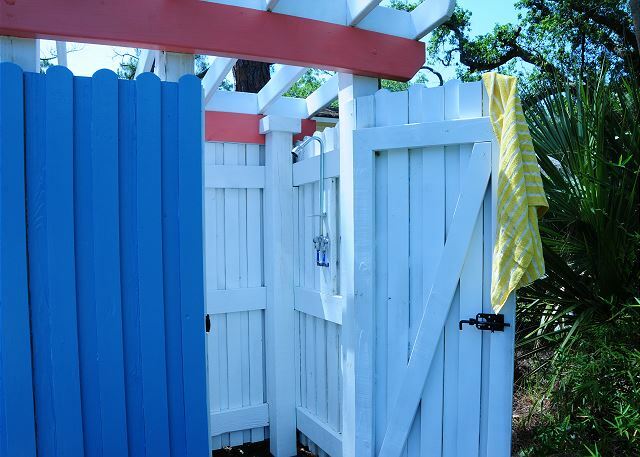 Bright outdoor shower will make after beach time so fun! More amazing colors. What detail wasn't thought of in this beautiful place? Even the outdoor shower is fabulous! Sit here and watch the world (read: Tybee) go by! NOTE: Blues Away has undergone a complete renovation due to damage from Hurricane Irma. We're excited to have Blues Away back and better than ever! Ready May 2018! Now with 2 full baths! 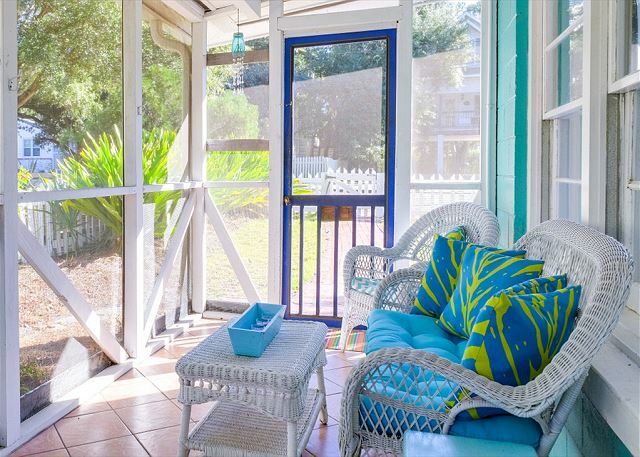 Your picture-perfect Tybee Island vacation awaits at Blues Away Cottage! 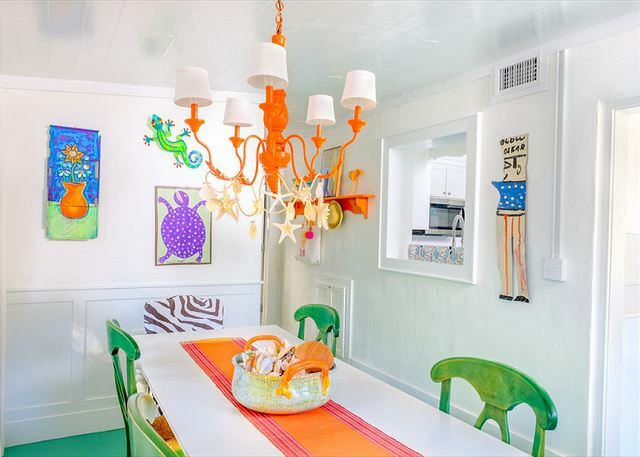 This colorful circa 1958 charmer is a "Mermaid Row" classic -- made all the more delightful with designer Jane Coslick's redesign and renovation. Bright, beachy and filled with original folk art (ORIGINAL FOLK ART: Howard Finster, Woody Long, R. A. Miller) & special touches throughout, Blues Away lets you leave behind the everyday world and immerse yourself in the breezy joys of Tybee. Welcoming you to your Island home are such creature comforts as central air-conditioning, beadboard ceilings, spacious living area, two dining areas, well-equipped kitchen with all new kitchen appliances, 2 full bathrooms and washer & dryer, WiFi, and three bedrooms: one master with a king bed and comfortable reading area for 2, a second bedroom with queen bed, and a third bedroom with two twin beds. 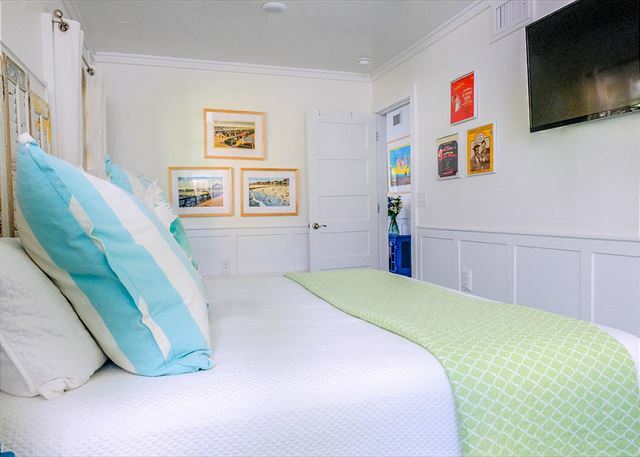 Flatscreen TVs in living room, master bedroom and twin bedroom. 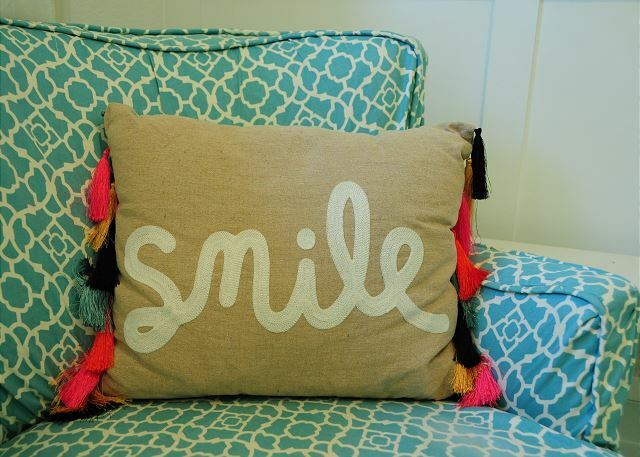 Each room delights you with fun details and comfy furniture that keep you smiling. 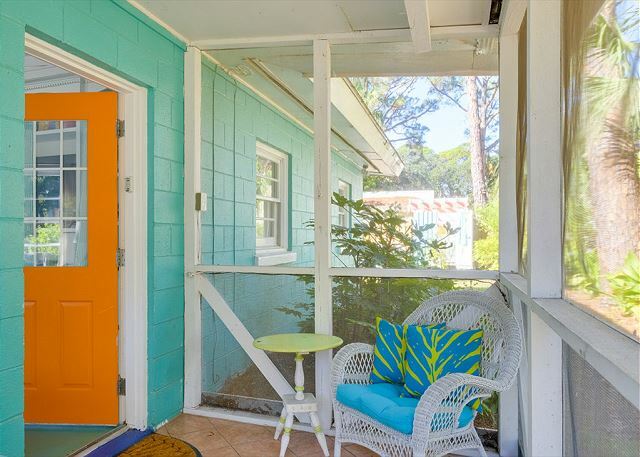 Beyond the cheerful and inviting screened porch, choose from three outdoor sitting areas to gather, relax and savor the sea air as well as a heated outdoor shower! 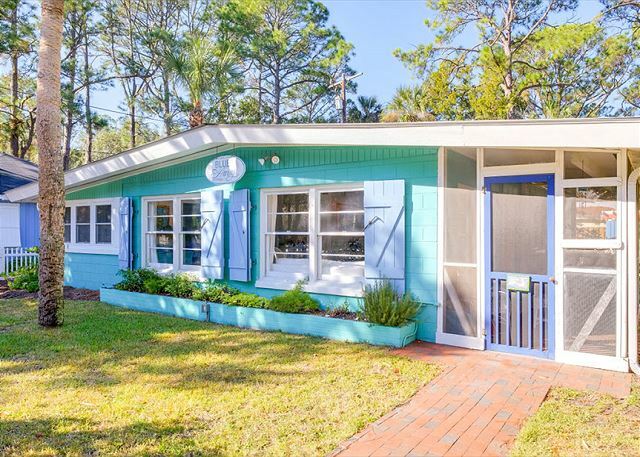 Location-wise, Blues Away truly “sits pretty” on the Island and is great for multiple families by being between Maddie's on Jones and Mimosa Cottage. Memorial Park, the Sundae Café and the Sugar Shack are each two blocks away, and the beach is as close as a pleasant 6 minute stroll or a 5-minute bike ride. Come make your getaway a special one at Blues Away -- a Tybee treat in every sense of the word! Please note: Longer minimum stay requirements of up to 7 nights may apply during certain times of the year including holidays and our summer season. We enjoyed Blues Away 5 years ago and were surprised and delighted by the renovations. 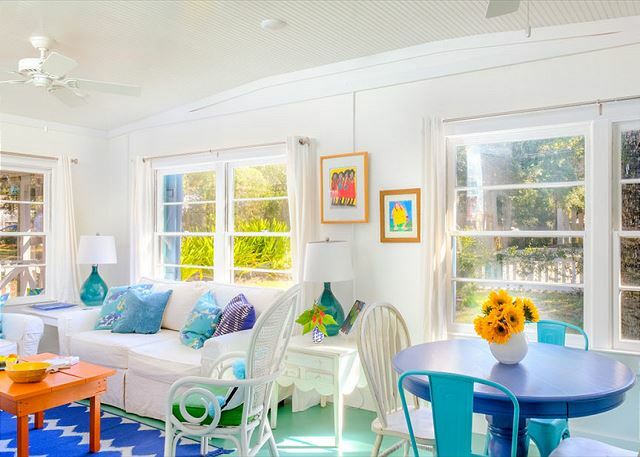 We love this light-filled house and walkable location for our lazy Spring Break. 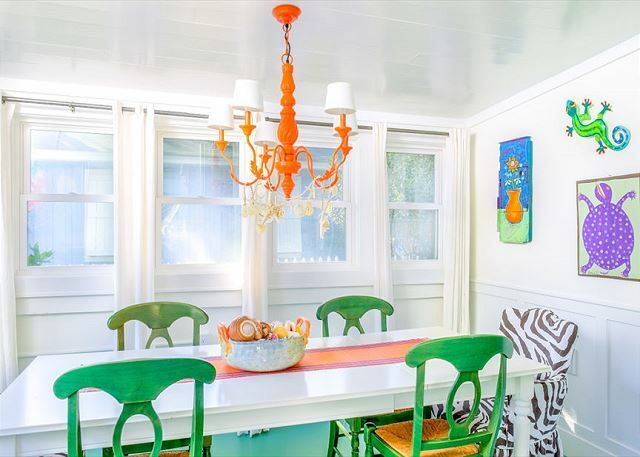 The Blues definitely went Away when walking into this lovely, brightly decorated cottage!! It was our first time here and will be coming back soon!! Blues Away For Sure on Tybee Time! Cottage was so colorful and well equipped that it was the best ever! 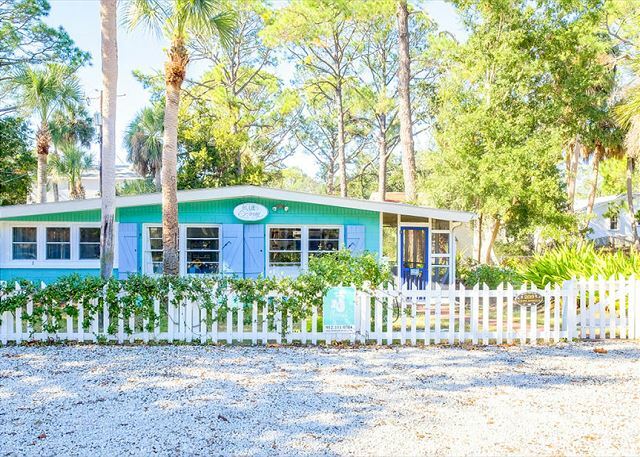 As a former resident of Wilmington Island and a frequent visitor to Savannah and Tybee, Mermaid Cottage service never fails to exceed expectations. Can't recommend Mermaids or their cottages enough. Had a great week visiting grandchildren. Beach is a short 10 minute walk. Well stocked kitchen. Mermaids were great. Continually updated us on status of hurricane. Only downside of location is lots of traffic on Jones Ave. Thank you! It would be great to have the doors latch because sometimes privacy from kids is greatly appreciated. But I trust that got fixed after our departure and request! We were blown away by how charming this house was. All the details made it feel so cozy. Plenty of space. Hooks outside for wet towels. Outdoor shower and foot rinse area. Really they thought of everything. Beds were great, kitchen well stocked, the mermaid coffee was delicious! Very close to the beach, easy walk to cafes and ice cream. Not a bad drive into downtown Savannah either. We will be back for sure! The only tiny negative was that we read through the materials in the house for check out instructions and then realized the in app check out instructions were different so we had to rush to complete some extra cleaning per the in app instructions and were a bit late checking out which caused some upset with the management. Met with old friends from high school at the Blues Away cottage. Everything was perfect from the very helpful staff in the office to the cottage we stayed in. Great outdoor seating areas, screened porch and an outdoor shower were very much enjoyed. The place was very clean, comfortable and had everything we needed and more. Loved the decorating and special touches. It was only a short walk to the beach and restaurants. Can’t wait to come back. We loved it! It was beautifully decorated and impeccably clean. It had every amenity we could wish for. The only complaint I can think of is that beach towels WERE provided, but the info they sent me ahead of time specifically stated that they were not, so we wasted some money buying cheap beach towels. Blue's Away: The Perfect Place to Stay! 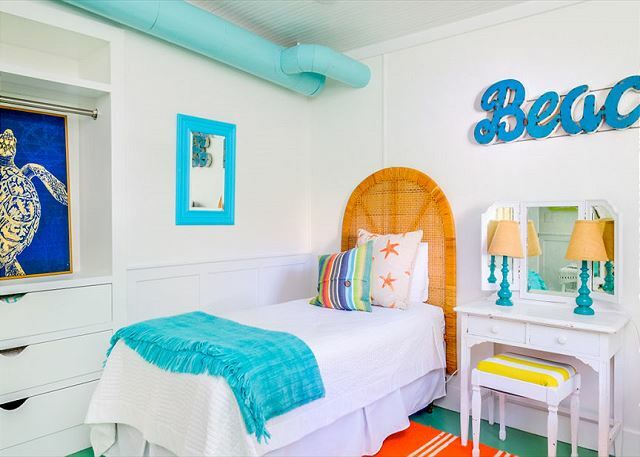 Blue's Away and Mermaid Cottages surpassed our expectations for our girls' beach trip! The cottage was beautifully decorated and super clean! It was just a short walk to the beach, shopping, and restaurants! The staff at Mermaid Cottages was friendly, helpful, and accommodating. We will definitely recommend Mermaid Cottages to our friends and look forward to our next visit! We had a wonderful weekend at Blues away! Loved the decor, the art, the books! The mermaids think of everything so you don't have to: th house was spotless and well stocked. Location is great, just a short walk to the Beach, and the house is cozy and relaxing. We will be back, and we highly recomm d using m remake cottages for your next vacation rental! Great cottage, extremely well stocked, beautifully decorated and very clean. Close to beach and restaurants. Would definitely recommend the area and cottage and hope to come back some day. Loved every aspect of his vacation home! My girls and I feel in love with this home! Can't wait to come back soon! Wonderful vacation. This was our third trip back to Tybee and first stay at Blues Away. It is such a beautifuly decorated house with plenty of room for seven adults. The Mermaid staff are always friendly and responsive. It is a short walk to the beach. Relaxing time was had by all. Blues Away is an amazing little cottage, so happy to hear you enjoyed it! Come see us again soon for more Tybee time with the Mermaids! The cottage was adorable but for the price you pay, I feel everything should be in working order. From the time we put in a work order request and when things were fixed was too long. Queen bedroom tv still wasn't working when we checked out. a guest from Winston, GA does not recommend this vacation rental. We have stayed at many other houses on Tybee, larger and smaller, but overall, I would say that we loved this house and would stay here again in the future. It was really quite big enough for at least 5. It is very close to the beach, only a one block walk, and (although you would not think this is that important) it was really nice that the gas station, the pharmacy, the ATM, and the liquor store were only a short block away as well. Unlike some of the other houses that we've stayed at, the beds were extremely comfortable as well. When I called to extend by one day, the rental company was very gracious, and offered me the extra day for free. Will definitely stay here again! Thank you Mermaid Cottages. We had a great trip! Perfect as it could be! Love the cottage, love how well they manage it, love the personality of the people who work for Mermaid. All in all, a wonderful stay!!! My three sisters and I had a wonderful and memorable vacation at Tybee Island and we loved our Mememaid Cottage! This was our first time to Tybee Island and Savannah. We had heard about the Mermaid cottages from a friend. What a darling cottage. The Mermaids were all so nice and professional. The cottage was spotless when we arrived. But, best of all was the cottage itself. The decorating was so fun and colorful. It was so comfortable and inviting. Most nights we just stayed in and enjoyed our little vacation home. Thank you for a wonderful week Mermaids! bathing suit and suntan lotion. The house has beach chairs and toys.We loved the out door shower! All the dishes and pans you will need. The cottage was very cute and everything was clean. The location was great because it's a short walk to the beach. Stayed here for four nights for a girls' getaway with three longtime friends in July. Can't say enough about the house. It is cute, clean, and roomy. 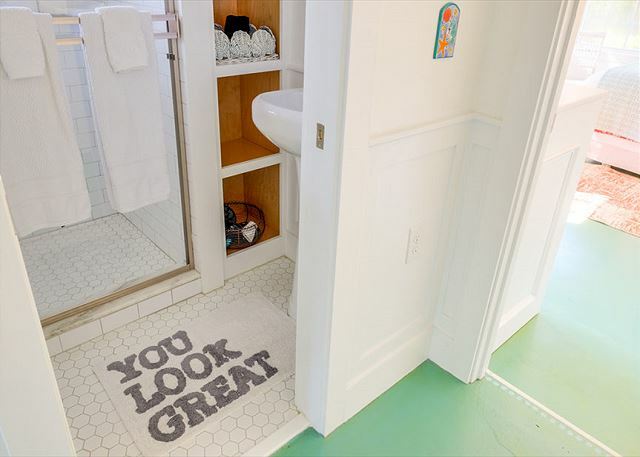 There are little details in every room that make it a fun place to stay. 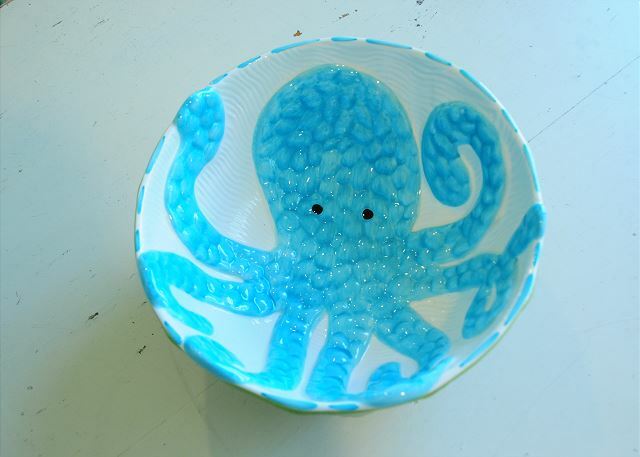 There were even cute dishes and glasses! It is not "upscale," but that's not what you come to Tybee for! 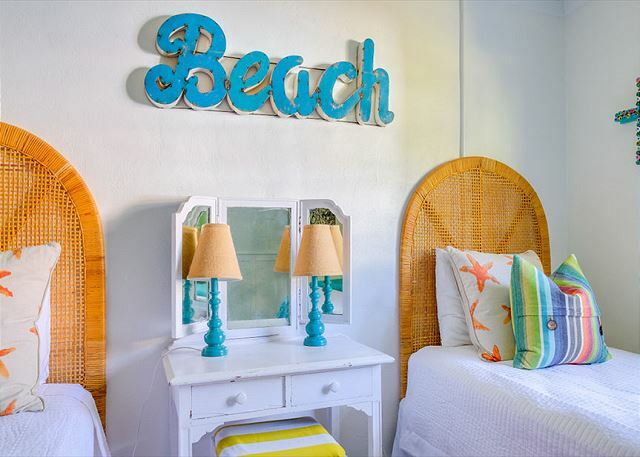 It is beachy, homey, and comfortable. Loved the beds! We sat on the screened porch most evenings. We walked to the beach - it's very close! We also walked to two different restaurants that were only a couple of blocks away. The Mermaid Cottage ladies called a couple of times to make sure everything was going smoothly. We were totally satisfied with our experience here and highly recommend this adorable property! We booked this cottage for a girlfriends reunion weekend. It was wonderful in every way, and we would have loved to stay longer. Thank you for an incredible stay!! We didn't want to leave 'Blues Away'! My two boys met my best friend and her hubby there for a mini-vacation & had an amazing time. We loved being so close to the beach & the layout couldn't have been more perfect. Also, you can't stay there & not become creatively inspired. Love, love, love this place! We chose mermaid cottages upon the recommendation of a friend. I found the website easy to use and inviting. I enjoyed choosing the cottages and seeing the inside pics. Than app option and key retrieval was great-the cottage was spotless and decorated beautifully! We loved mermaid cottages and will/would def stay again and rave to our friends and family! MERMAID COTTAGES ARE THE BEST!!!! I have stayed in a Mermaid cottage twice and I have asked to look at others that were unoccupied at the time. The mermaids are wonderful and very accomodating. The cottages are always spotless and beautifully furnished. 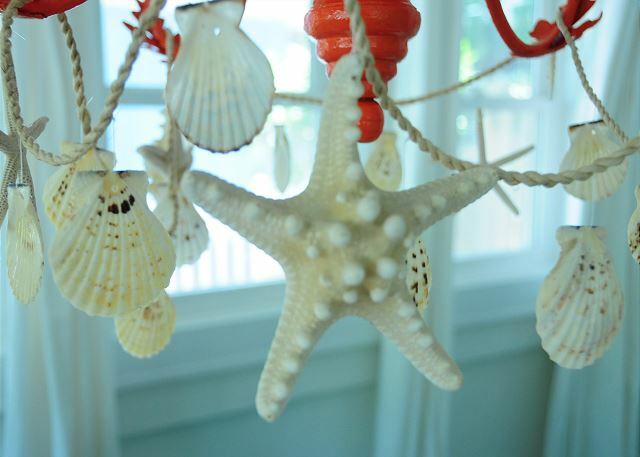 The overall experience of staying at a Mermaid Cottage on Tybee Island deserves a 10 star rating! It is better than owning your own because you get to experience a different one each time. I am looking forward to my next visit. I have recommended the Mermaids to everyone I know who is interested in a wonderful beach experience. Be sure to rent bicycles. 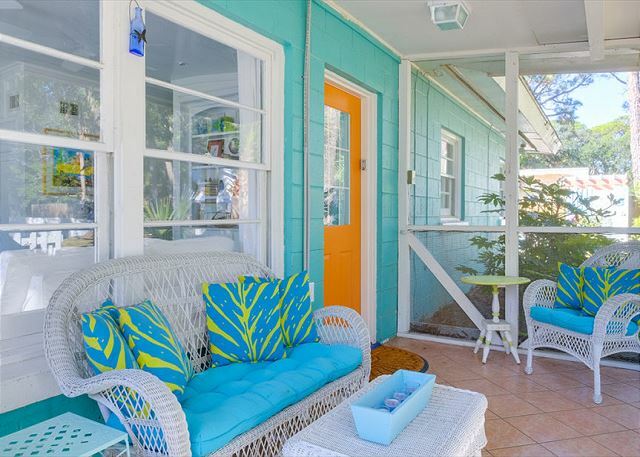 I hope to retire next year and my dream is to spend every April and October in a Mermaid Cottage on Tybee Island. The cottage was perfect for our family of 4, and we had plenty of room to stay inside on rainy days. House well well stocked, nicely decorated and comfortable. It was nice being close to the park too. 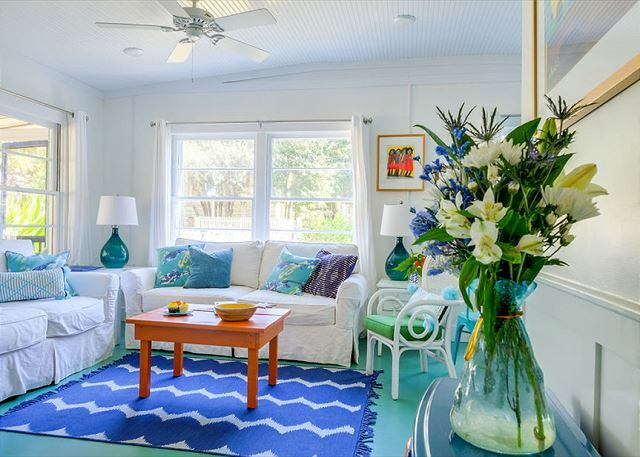 Blues Away Cottage is a wonderful place to stay when vacationing on Tybee Island. We had a wonderful time! The cottage was lovely. It was pretty, clean and conveniently located. We had a fantastic week at the Blues Away. Cozy and quirky, we easily settled in and felt at home. Some girls and I came in from different parts of the country for a "girls week retreat". None of us had been to the area. 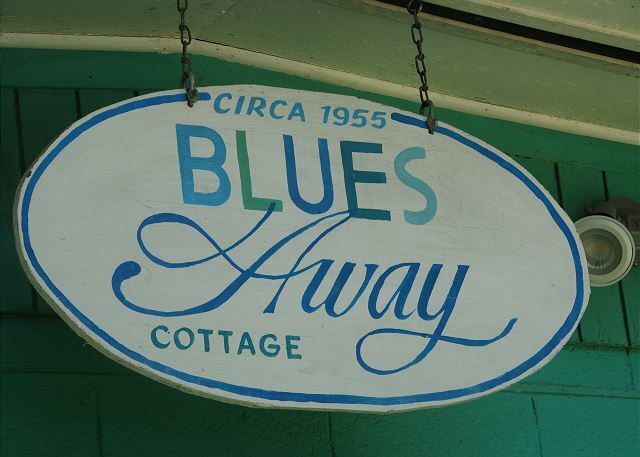 Blues Away Cottage was the perfect "home base" to come back to after visiting Savannah and of course Tybee Island. It is so comfortable and inviting. It has everything you need for a wonderful vacation. The beds are even comfortable! It also is in such a great location on the island. Just a short 4 minute walk to the beach! There was a day or two that we just hung around the cottage because it is so peaceful. I would definitely stay at this beautiful cottage again! We fell in love with Blues Away Cottage and Tybee Island, we will return! Francis Kay did a great job on cleaning and Linda-in guest services was very helpful during our stay! Excellent customer service we can't wait to come back! My wife and I stayed at Blues Away for our honeymoon for a week. The cottage was very clean and had just about everything we needed. Everything worked fine. We were close to the beach which was perfect for us. Mermaid Cottages did contact us a few times before we arrived to make sure we had all the information we needed and that everything was ready for us. Overall it was well worth the money spent to stay here. We definitely plan on coming back again for another vacation. All was ideal, loved the cottage, decor, location. Francis Kaye stopped in, brought us flowers and checked to see that all was satisfactory. We would return in a heartbeat. Another fantastic Mermaid Cottages stay! 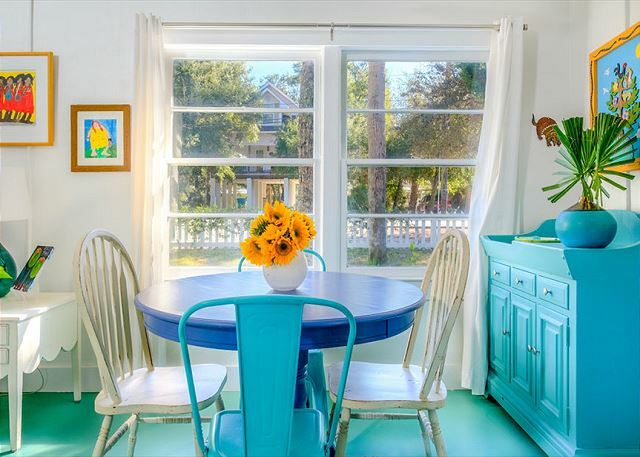 What a wonderfully quaint, picture perfect cottage experience on Tybee Island! The cottage was bright and charming w all the comforts of home. We could want for nothing. A bicycle ride away to the beautiful Tybee island beaches. We also enjoyed pedaling through the quaint cottage neighborhood and along the scenic marshes of the Back River. A wonderful experience! The cottage was absolutely amazing! We arrived to Tybee Island early and the staff was very accommodating, and allowed us to check in early. After the 23 hour car ride from New York, we were greeted by the cheerful and helpful housekeeper, Mrs. Kaye. She was also very accommodating. Everything about the house was great and welcoming! The beds, couches, and pillows were so comfortable! The beach was very clean. The weather was showed a week of thunderstorms, but the weathermen got it wrong! We were able to soak up the sun everyday! Thank you for a great stay!! We will surely be back again! Blues Away Cottage truly felt like home for a week. Access to the beach was easy. We enjoyed the screened in porch during the evenings. Loved the outdoor shower. The house is decorated in a very fun manner, and is well stocked for cooking. Just a great place to stay. The bike route street, just one street away, provided a great way to get around the island on our rented bikes. Cottage was just the rigjt size, comfy and clean. Beach is within minutes. Iv have stayed in 2 other cottages and this was poo ne was the best by far.Will be back for sure. My family andd I enjoyed this lovely cottage. We had lots of fun on the island, and enjoyed our favorite foods at A.J. 's and Sting Ray's and snuggling down in Blues Away Cottage each night. Thanks for another great year! This is our second time staying in a Mermaid Cottage and Blues Away exceeded our expectations. The house was so cute and had lots of room for our family of five. It also had all the amenities we needed. The location was great as it is only a few blocks away from the beach, restaurants and stores. We love Tybee Island and can't wait to come back next summer! We loved the house, it was beautifully decorated and well equipped. The outdoor shower is fun to use! Our family had a great time. We truly enjoyed our stay at Blues Away Cottage. The furnishings were comfortable, the kitchen well supplied and plenty of space for the family to spread out. We came to Tybee Island for my son's wedding and all the other wedding guest staying on the island agreed that we had the best rental. The personal attention from our 'Mermaid' was icing on the cake. We plan to visit again and will definitely use Mermaid Cottages. 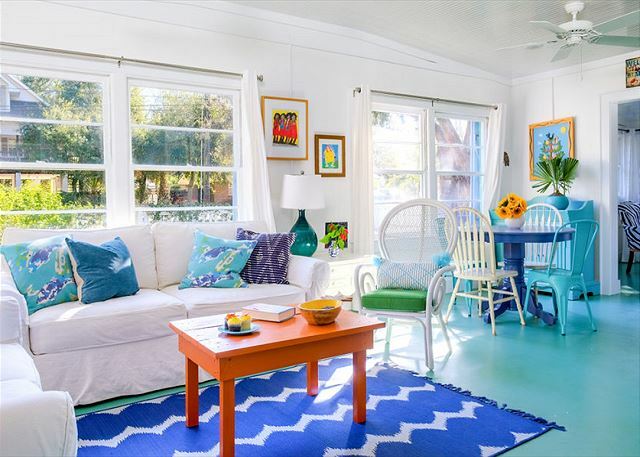 Blues Away Cottage circa 1955 on Tybee Island took our hearts away! We stayed in this sweet little cottage right on Jones Ave June 7 - 14, 2015 and loved absolutely everything: the location, the decor, the bright & sunny colours, the tranquility and more. 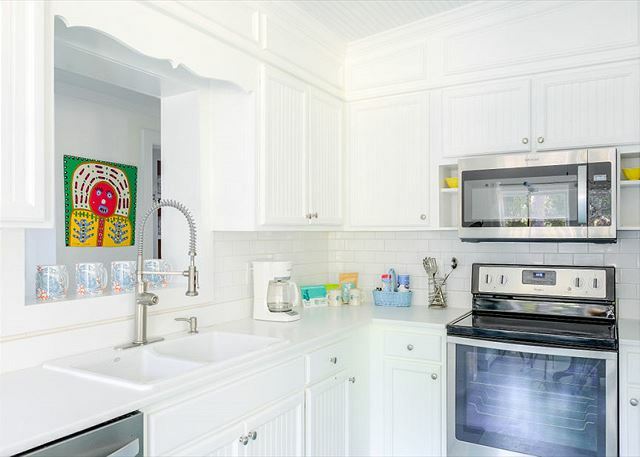 The cottage was fully equipped with everything a family needs for a week at the beach including a well-outfitted kitchen, ample room to spread out in three beautifully decorated bedrooms, or to gather together around the dining table for some amazing Low Country BBQ or game night. We especially enjoyed the screened in porch for reading, cocktail hour, or to just listen to the rain clearing away the late day humidity. The mermaids, Jan, Francis, and of course head mermaid, Diane, made sure we had everything we needed and checked in with us regularly to make sure we were enjoying the best of Tybee Island. This was our first trip to Tybee, but it definitely won't be our last! yeah!! sol glad you had a great time!! xox! Amazing home! Great attention to detail! This is the second time I've stayed in a Mermaid Cottage on Tybee and once again it was wonderful. Six of us stayed there for a bachelorette weekend and we all loved it. The porch was perfect for us to sip wine and chat. The rooms were wonderfully decorated and the delicious coffee was a great touch. We walked to the beach--only took minutes--- so didn't have to deal with parking issues. Our June trip to Tybee was wonderful. We thoroughly enjoyed Blues Away cottage, which was comfortable and well-stocked. It even had a blender to make smoothies. It felt like home thanks to quiet location, the fenced in yard and plenty of outdoor seating. It is about a three block walk to the beach and the hose in the front yard allowed us to clean our feet when returning back each time. Thank you for helping us to enjoy a memorable family vacation! The most perfect little cottage on the island! 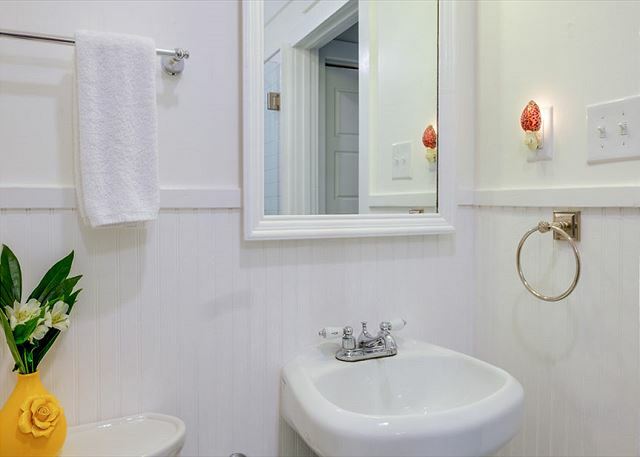 The cottage has a beautiful interior with lovely furnishings, quaint decor, and the perfect layout. The outside of the home was just a wonderful. The perfect place for an all girls trip! And just a few minutes walk from the beach. Would definitely return for another trip. Our stay was wonderful, and Blues Away provided everything we had hoped for. The cottage was exceptionally clean and provided all we needed for a great stay. 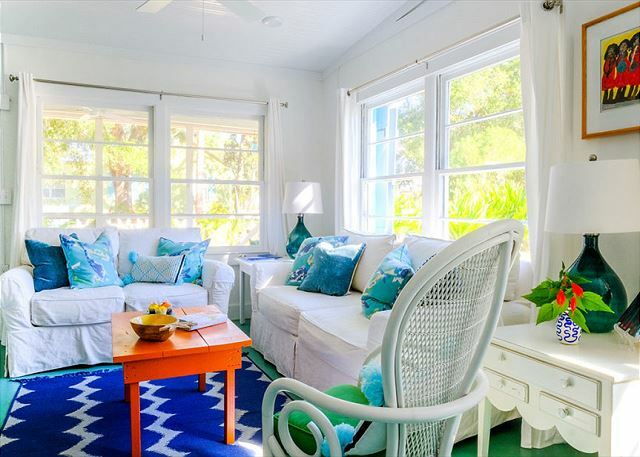 You couldn't possibly feel "blue" after stepping into the Blues Away Cottage. The happy colors, adorable furnishings and art, and gazillion windows made us smile every time we walked through the door. Hats off to Ms. Coslick for the décor! And, to the maintenance team who've kept everything sparkling clean. The kitchen was fully equipped and there were plenty of towels, washcloths, and anything else you could think of. For a little extra fun, you might consider renting a golf cart from Ed @ 912.226.9676. He was delightful and we had a blast riding around looking at other Mermaid Cottages. Can't wait for the next visit! 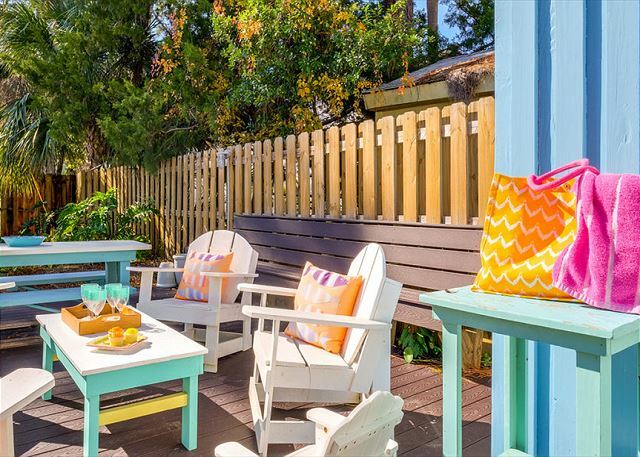 This was our 4th visit to Tybee Island and Mermaid Cottages once again outdid themselves! 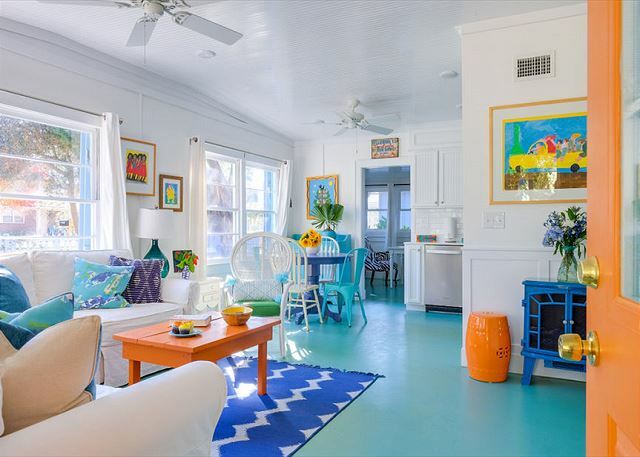 Blues Away cottage was not only decorated in the perfect beachy way, but was comfortable, clean, close to the beach and everything we needed in a vacation rental! The Mermaids are amazing! 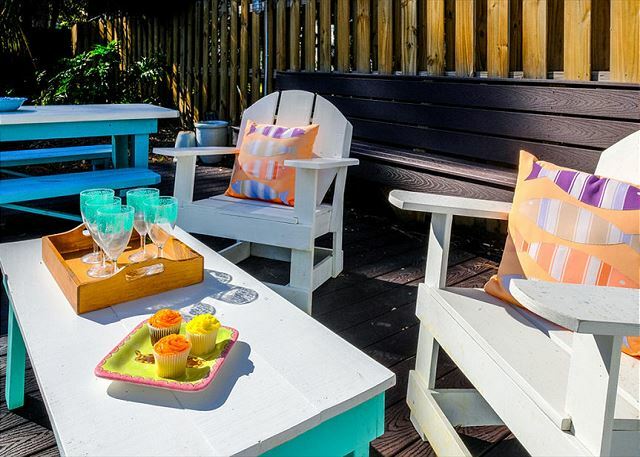 Their attention to detail and topnotch customer service are why we tell friends they should visit Tybee and stay in Mermaid Cottage! Warm, inviting, captivating, charming. This cottage is all that and more! Our family of 5 (which includes 3 picky teen girls) fell in love at first sight with the Blues Away cottage. The kitchen has every convenience. Beds and furniture are so comfortable and cozy. Beautifully decorated this is the perfect beach house. We were so sad that we couldn't stay the whole week, and would love nothing more than to pay a return visit! Sweet, charming cottage/ good location for beach and amenities. Lovely to stroll around neighbourhood. We loved this house! It was clean, spacious and had all the things we needed to keep our three small children happy. The house has all the comforts of home including a stocked bathroom and kitchen. I have never seen a rental vacation house have so much consideration for their guests. Very close to an ice cream shop, grocery store and the beach. We have already started checking the availability for our next trip down. What can we say? This is a beautiful little (yet roomy) cottage that was perfect for our family of 6. The place was well supplied and exactly as advertised. We loved the location (only a few blocks from the beach) and appreciated how central it was on the Island. All communication with the folks at Mermaid Cottages was very professional & we honestly have no complaints about anything. We had a wonderful relaxing vacation and would do it again in a heart beat! We loved our stay at Blues Away cottage! The decor was beautiful and it was kid friendly. My 4 kids spent time playing in the yard and we loved being able to walk to the lighthouse, the park and the ice cream shop. Thank you to Mermaid Cottages for honoring veterans! Excellent. Beautiful cottage, great location, thoughtful amenities like WiFi, air conditioning, beach chairs, plenty of towels. This was our 2nd visit to Blues Away and we love it. We enjoyed a spontaneous weekend trip to the beach and we splurged on a house rental instead of a hotel. With small kids, it's totally worth it. Quality details, happy decor, easy location. Wish I was still there! Super Cute, Super Clean and Super Fun! There aren't enough stars to rate or wonderful adjectives to describe this cottage! And it is in an absolutely great location, just a couple of blocks to a great part of the beach. The bike path is convenient, just one block over. The Mermaids have anticipated your every need and have the cottage stocked with everything you could possibly want for your stay. They are truly a top notch agency. We couldn't of been more pleased with our stay in this super clean, super cute cottage. We had an absolutely fantastic time at Blues Away Cottage! 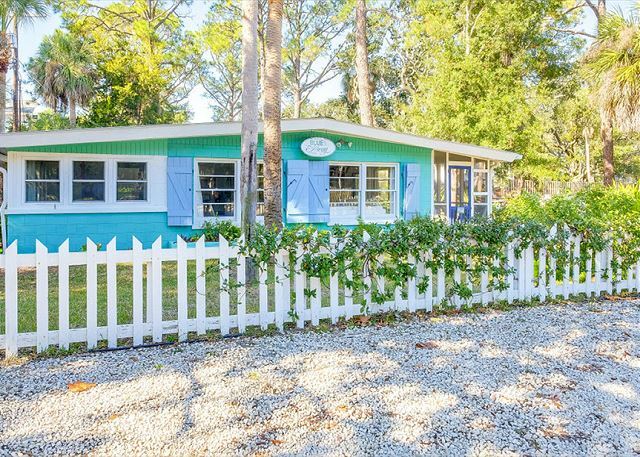 It is so adorable and very close to the beach! My family of four thoroughly enjoyed our 5 day stay in the Blues Away Cottage. The cottage was extremely well kept and much to my wife's delight very well decorated. The décor is pleasant and exudes relaxation. 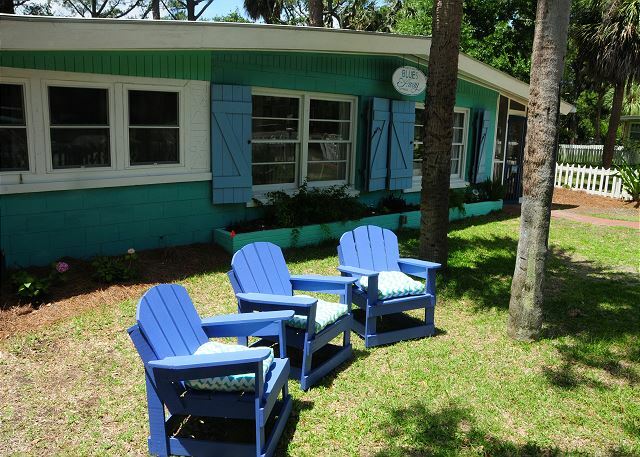 I would recommend Blues Away Cottage and Mermaid Rentals to anyone visiting Tybee Island. We intend to visit at least once a year and hope that there is availability. The on-line description of Blues Away Cottage was completely accurate. Walking into the cottage immediately brings a smile to your face. The colors and furnishings are so delightful! It is located in a quiet residential area amongst other cottages & homes. The cottage was so bright & clean (THANK YOU FRANCES KAYE & CREW)! The amenities that the cottage provided made our group feel very comfortable and "at home". There were no maintenance issues that needed immediate attention. The property owner was very pleasant and provided an immediate response when a question arose. I would definitely recommend Blues Away Cottage to a friend or relative and hope to return one day! Not a single complaint here. We spent a very happy week at this groovy beach cottage. Loved the low key vibe of Tybee, bikeable neighborhoods, and pleasant stroll to the beach. The house was perfectly comfortable for our family, including 2 small kids. We loved the outdoor shower and cozy porch! 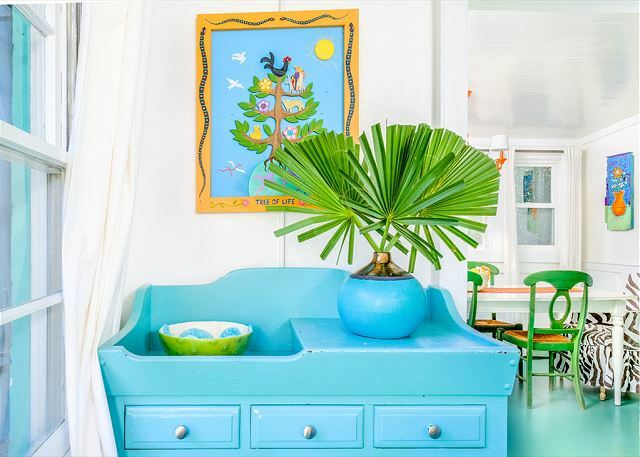 The stylish decor and fun folk art put us in a happy beach mood for the entire week. You can only be happy and at peace when you stay at blues away cottage. My family loved this place and our stay on tybee here. The home is a wonderful space - from all the pretty little beach and vintage details to the outdoor shower and outdoor seating areas. Loved the screened in porch at night! I gave a 4 on cleanliness because we noticed the floors needed mopping after arrival. The mermaid team took care of it right away. We've stayed at mermaid cottages before and I will be back and continue to recommend to everyone. Blues Away Cottage is a beautiful rental. We had a wonderful time and will be back. Thank you for all the help and attention. You all are the best! My daughter and I celebrated Mothers' Day at Blues Away cottage and had a spectacular time. Even the weather cooperated nicely! We were very happy with the cottage. It was nicely appointed and had everything we needed! It was very clean too. Only two things could be improved: The queen bed I slept in in the back bedroom had an extremely squeaky mattress/box spring, and the bed itself wasn't that comfortable. I would suggest replacing it with new. And the grout in the main bathroom looks like it could use cleaning and regrouting, a simple fix. Just looked kind of dingy. Overall, the cottage and our stay was wonderful and we plan to come back to Tybee again for another visit. We might try one of the other cottages, just for a change. They are all so cute! Very cute cottage! It was clean, well stocked, and in a good location. Not walkable to much if you have small children, but I would definitely stay here again. Thank you for your review and recommendation for Blues Away! We are delighted that you enjoyed your stay and hope to see you again very soon! Blues Away is a favorite, but please let us know if you prefer a cottage within closer walking distance to beach and restaurants and our reservationists will be happy to help you select the perfect cottage for your stay! We welcomed several family members from Texas to Tybee for the weekend for my mother's 70th birthday. 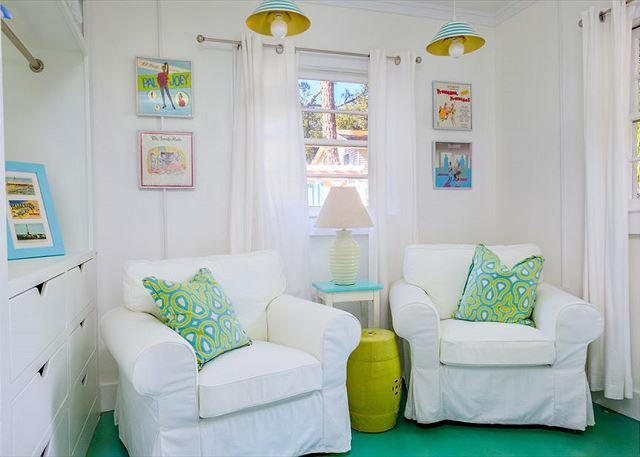 The Blues Away Cottage accommodated all six of us comfortably, and we all loved the bright, beach-colored decor. We shared family meals at the dining table, sat beneath the trees and drank wine and talked, got to know some of the neighbors, and slept like babies in the comfortable beds. The only thing that would have made it better would have been to be located right on the beach - but we were only a short drive to the sand, so that didn't really matter. Management was quick to respond to our needs and friendly with follow-up. We've talked now about making this an annual retreat. Our family enjoyed 3 wonderful days at this cottage. It was well-equipped, beautifully decorated, and amazingly clean and comfy. It is a short walk to the beach and in a very quiet area. We loved it! We were so excited to see a *NEW* Mermaid Cottage to stay in. Blues Away was well appointed & so comfortable. The Jane Coslick decor was gorgeous & the location was great! It was a short walk to the beach & the front porch was a great place to store our beach gear & enjoy the lovely weather. Mermaid Jan helped us with anything & everything we needed. I've already recommended this cottage to friends! We would stay at Blues Away again in a heartbeat. The "Mermaids" were so helpful they helped make our trip to Tybee one the best weekends away ever!! Will definitely rent from Mermaid cottages again. The cottage we were in was clean and well stocked, great location. The house was fun, clean and well equipped. It comfortably accommodated our group of seven, and the check in/out process was effortless. 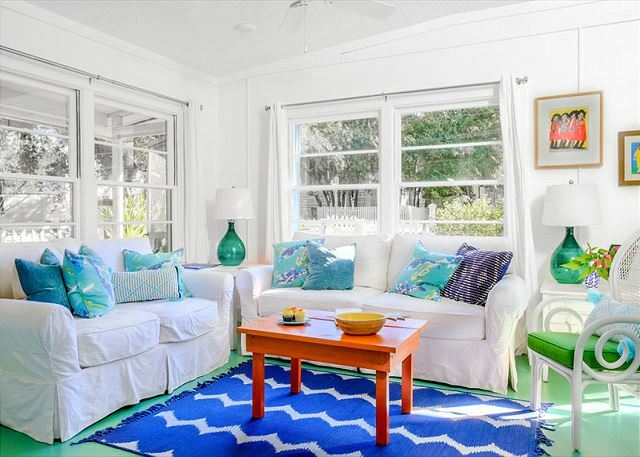 We love Tybee Island so this house was a no brainer. Although it is a couple blocks or more from the beach, it has privacy and is fenced so you can take your pet. It has a nice retro l950's feel. Very clean and the main bedroom mattress is very comfortable. We didn't use the other beds, so can't compare them. 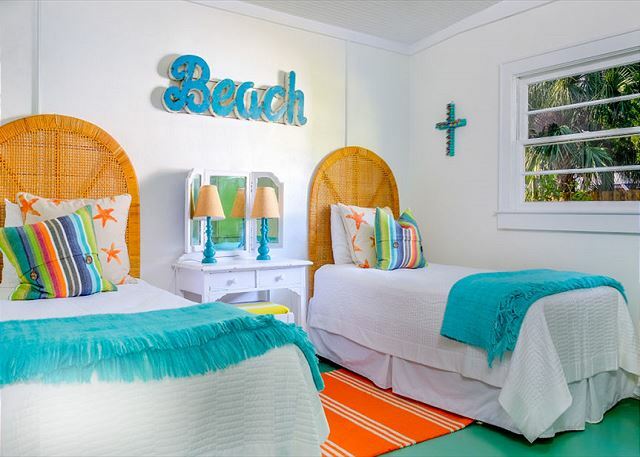 Thsi is the third year that the Saleeby/Petersens families have stayed at the Flip Flop Cottage during the weekend of the Beach Bum Parade!! It meets all of our needs and we love love love it!!!! It is our second home, with so many fond memories!!! WE are already planning for next year!!!! Always love Tybee for a long weekend. Flip Flop is nothing fancy, but it's clean, cozy and just as described. Short 5 min. walk to beach and nice sunny front yard for evening apps and cocktails. Dealing with Mermaids was delightful and easy and I will use them again! We stayed with another couple, our 4 dogs and a cat. The property was great when traveling with pets. Nice large fenced in yard for the dogs. The house was in a great location. It was a short walk to the beach and some local restaurants. The house was equipped with everything we needed. My only complaint was that the place was not as clean as I would have liked as I found items under the bed that should have been cleaned up. Overall the place was fine for a beach cottage if you are traveling with your pets. We came down for our sons wedding and could not be happier with the flip flop and well as with mermaid cottages! Everyone was so nice and helpful and the home was great. It had everything we needed and a couple things we didn't know we needed :) thank you mermaid cottages for making my sons wedding wkd so perfect! 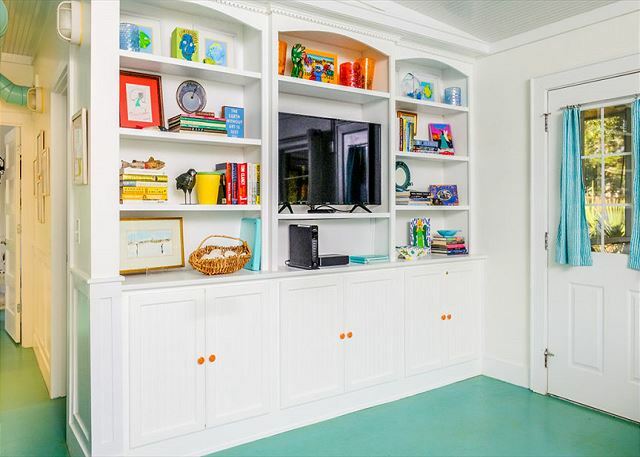 Perfectly decorated for that vintage beach feel and stocked with everything we needed or wanted including books to read and movies to watch. Mermaids were very accomodating when we had a health issue that prevented us from staying during our originally scheduled time. Close to everything and easy location to bike from. We will definitely be back! We met our daughter there and had a great time just hanging out on the screened porch and visiting,and it was close enough to every thing, can not wait to come back. We loved our stay on Tybee. The cottage was cute and friendly! The kitchen was well stocked! We had everything we needed and more! We look forward to visiting again! The staff at Mermaid Cottages was very friendly and helpful. They gave me a discount when I called to ask a question about the online reservation process. The cottage was spotlessly clean and had everything we needed to prepare meals and be comfortable for our stay. 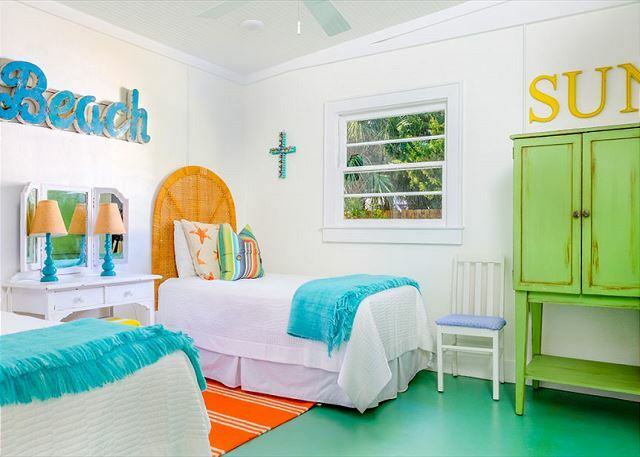 The Flip Flop cottage has a prefect beach feel. 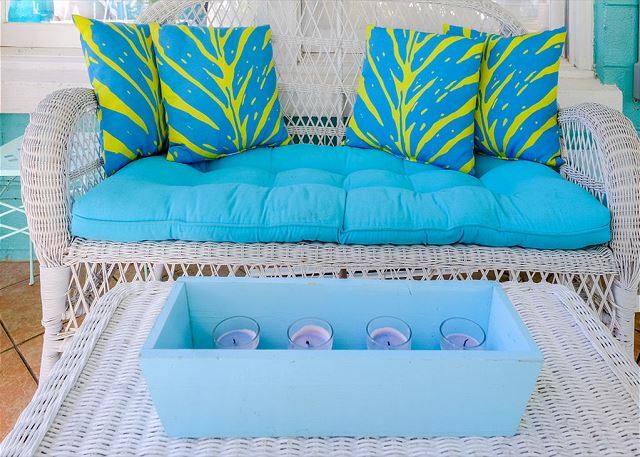 The outside is eye-catching, with beautiful seafoam green and bright colors. Everything from the outside to the inside is decorated with a truly unique touch. We found it very interesting that the cottage is part of the cottage preservation program. The walk to the beach is not very far, but a little inconvenient if you have a lot to carry. 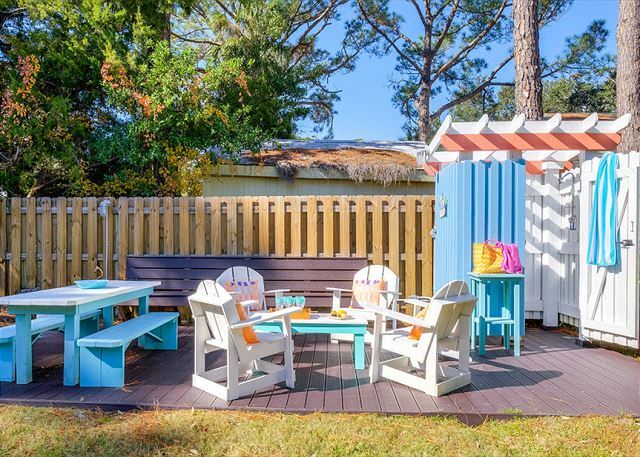 Tybee is prefect, and the Flip Flop Cottage just adds to the magic of the little island. The shower inside is slick on the bottom. Maybe the mermaids can do something about that so the older guests will not have to worry about slipping. Stay here!! Enjoyed our stay. Cute & bright Cottage. we had more than enough room for our family of four. Only wished that it had been available for longer. We would have stayed! The Mermaid cottages staff were wonderful to work with. Everyone was happy, professional and easy to work with. They made the whole process easy. We'll definitely try to rent with them on our next visit! This home provided everything we needed for our stay. What a wonderful property and staff. We cannot wait to return to this home. 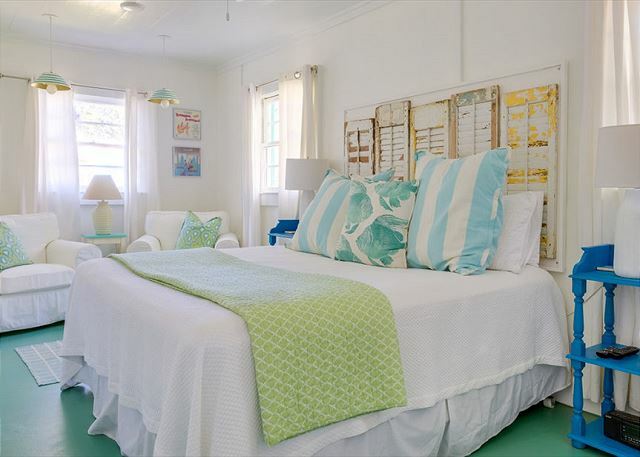 Mermaid Cottages provide us with a wonderful family vacation every summer! A casual, friendly community with great beach spots and fantastic bike-riding areas. Staying close eliminates the hassle of driving to the beach each day. Flip Flop Cottage: An Excellent Experience! We were completely thrilled with every aspect of Flip Flop Cottage. 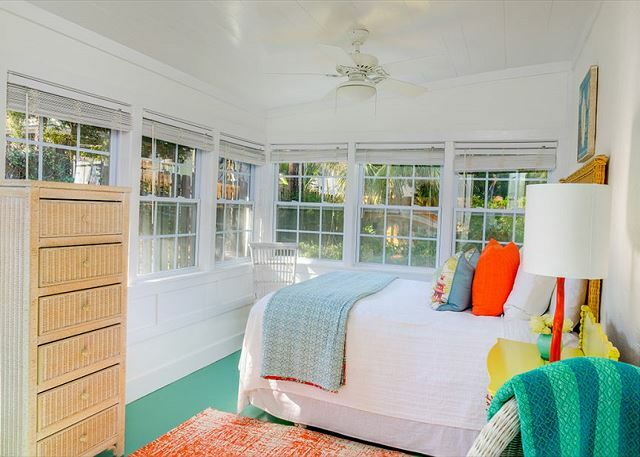 I would recommend this cottage to any larger group because of the spaciousness of the space and the wonderful atmosphere of Tybee Island. This was our second time visiting the island and staying in a Mermaid Cottage rental. We were delighted with both experiences and will be visiting again. 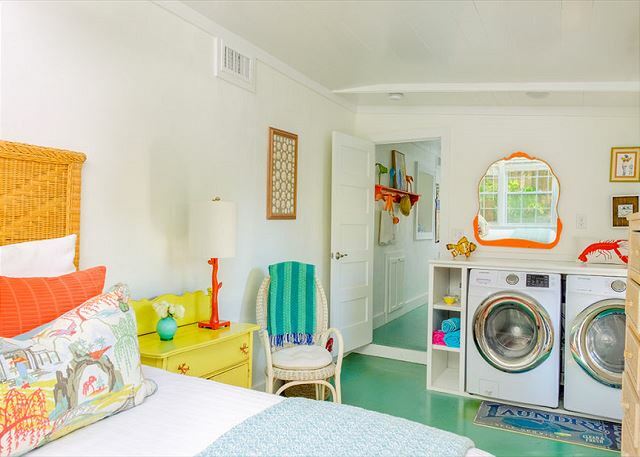 Flip Flop Cottage is a MUST visit Attraction! It was something that I had never experienced before. The people were excellent, their service was beyond approach; especially when asked for assistance with handicapped capabilities. Also, I would like to recommend night lights in each cottage. A couple of the rooms were pitch black at night. Other than the issue with the lighting, I have no complaints regarding my visit to Tybee Island. Everyone in our group was very satisfied with our vacation. We plan on returning next year, if that is okay with you guys!! 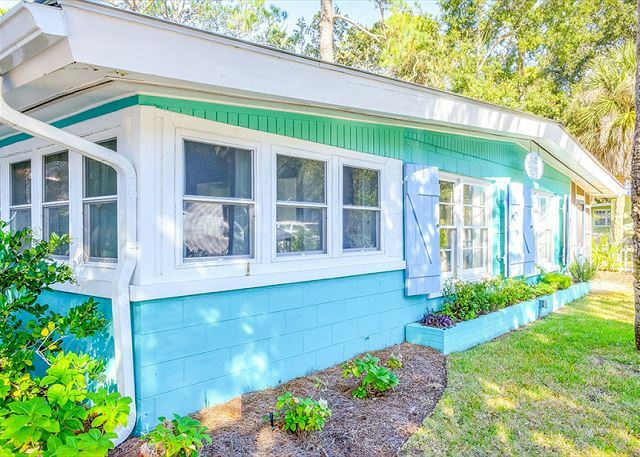 On a scale of 1 to 10, I give Mermaid Cottages/Flip Flop cottage a 10! I would also like to express my sincere thanks and appreciation for a happy, happy, happy vacation! P.S. If possible, would you please send informational brochures/price lists for tour guides, etc for when we book in the future. That would greatly assist in planning our next vacation! Once again, my group and I would like to say 'Thank You' for a job well done and giving us a lovely vacation! Give your staff a pat on the back! I received a call on our way down to the beach saying that the oven in our original property was broken and was given the options to either wait a day for a new oven to be installed or stay in another property. We chose the latter and were very happy. As always, the cottage was very clean and comfortable. I only gave 4 out of 5 stars for location because Jones is a pretty busy street. Other than that, everything was perfect! It was great....we made a last minute decision to get away to the beach (dog and all) and this was a great setup. Walking distance to the beach and has PLENTY of room. Very cozy. Tybee Island beach Bum Parade, Take 2!!!! This was our second year staying at the Flip Flop Cottage for our annual Tybee Island Beach Bum Parade trip, and it was PERFECT!!!! The cottage is exactly what we need and we love the location!!!! WE will be back next year!!!! We had so much fun! The Mermaids could not have been better to work with. From setting the trip up, through departure - these ladies rock! We'd never been to Tybee before, but everyone is asking when we are going back! The house is beautifully decorated and very comfortable to be in. It is a perfect home away from home! I very much enjoyed my week's stay at the Flip Flop Cottage. 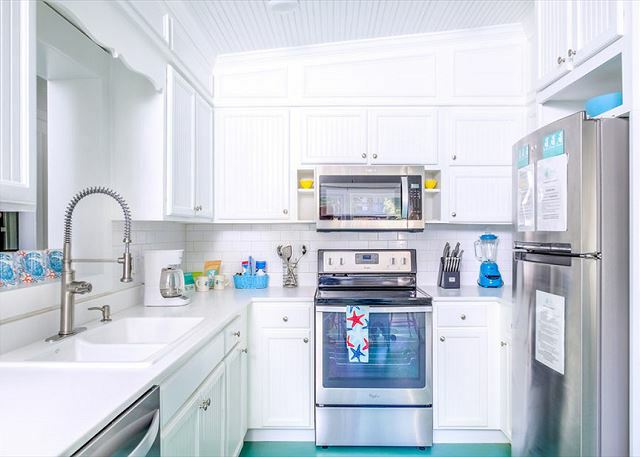 It is conveniently located at the northern end of Tybee and within walking distance to the beach, a playground, a convenience store, pharmacy and several restaurants. I also walked to the lighthouse and once to the southern end of the island. The cottage is set a little away from the street and I found it peaceful. There is a fenced backyard which was safe and convenient for my two dogs. I would definitely recommend this cottage. A couple of friends and I were in town for the Critz Run in early February and we had a great time. The house was super clean, had so much space and was conveniently located to a lot of stuff. It's sort of residential so it's not the place to stay in you are trying to stay in the middle of everything, but it was perfect for us. Overall, we had a great time and couldn't have asked for a better experience. The folks at Mermaid were excellent, courteous and so professional! 2 1/2 blocks to beach! Flip Flop cottage was adorable. Loved the location close to the beach, but Jones Ave. is a busy street. The only negative about the property was that the outdoor shower was far away from any door and seemed like it was in the woods, with pine needles everywhere and not very hospitable. My kids saw a snake and refused to shower anywhere but inside. Otherwise it was a fun stay. I'd choose other Mermaid cottages, just not this one. Thank you so much for the feedback on the outdoor shower and I have forwarded this to our housekeeping manager. Because it is the secondary route from one end to the other end of the island, Jones Ave can be busy at times and the city has taken steps to slow it down by reducing the speed limit to 20mph and placing stop signs at some of the busier intersections. But the location also gives the advantage of the proximity to the city park and playground with the tennis courts and beach vollyball across the street. On your next visit, please let us know about this visit and we can assist you with a cottage at the quieter end of the island. I'm glad you did enjoy the cottage and the beach and we hope we see you back soon. Flip Flop was a nice trip for a group. wonderful about our stay there and we look forward to "coming home" again in future years. Thanks Mermaid Cottages for making our stay stress free and totally relaxing with 4 kids and two dogs. We look forward to our vacation in Tybee every year and renting through Mermaid rentals is a must! Thanks again for a wonderful summer retreat!